“We’re in the 8th inning,” some have said. “We’re in extra innings,” say others. Generally speaking, real estate cycles last about ten years. The last real estate cycle peaked in 2007, so it came as no surprise when experts predicted real estate prices to dip last year. In fact, metro area home prices climbed 6.7% last year. Rents also increased by 2.9% over the past year. No matter who slices the data, almost all real estate experts agree that Boston-area home prices will continue to climb in 2018. Zillow predicts home values will rise 3.3% over the next year. CoreLogic suggests they’ll rise 4.2%, with lower-priced homes appreciating at even higher rates. We suspect this is, at least in part, given the interest from first-time homebuyers trying to gain a foothold in the market before interest rates go up. Limited inventory is also driving home prices. Boston added more housing in 2017 than it has since the 1990s, issuing 5,349 permits for new houses, condos and apartments. That marks a 17% increase over the number of housing permits issued back in 2015. Still, it’s not enough. Boston’s population continues to grow faster than developers can build new units. Boston could easily accommodate 30,000 housing units per year just to keep pace with national population growth. First-time homebuyers will often wait much longer when there is low supply, or seek properties further away from Boston. We expect buyers to expand their search as far as Providence, where their dollar can be significantly stretched. This is especially true now that more of Boston’s employers are offering workers flexible schedules with the ability to work from home. And therefore… rents will continue to rise. Priced many out of the Greater Boston real estate market, many who would otherwise prefer to buy are instead opting to rent while they save (increasingly more) for a down payment. Tax reform may have also reduced the benefits of homeownership, particularly in high-cost areas like Massachusetts. Regardless of any potential tax implications, first time home buyers generally become wearier as prices continue to climb and often take the safer bet of renting longer to see if prices will cool. As a result, we expect to see less apartment turnover this year, with tenants asking to stay put at the same price point. For units that do turn over, and new units coming online, we expect to see anywhere from 2-10% upward swing in rent prices. The large discrepancy is due to the variability of Boston’s neighborhoods, with some experiencing larger rent increases than others. We’ve been monitoring web traffic and interest in each neighborhood, and our real-time data suggests demand will be shifting in various neighborhoods, pushing and shaping rents in the process. Contact us to learn more. Institutional investors will be bullish on the local market. With the compression of cap rates in cities like New York and San Francisco, we have seen even more institutional investors start placing their capital in Boston-area real estate. Institutional investors (such as insurance companies, endowments, pension and hedge funds) will be drawn to the stability of Boston’s real estate market. Local hospitals, universities and robust life sciences and tech industries make Boston well-positioned to weather any potential downtown. 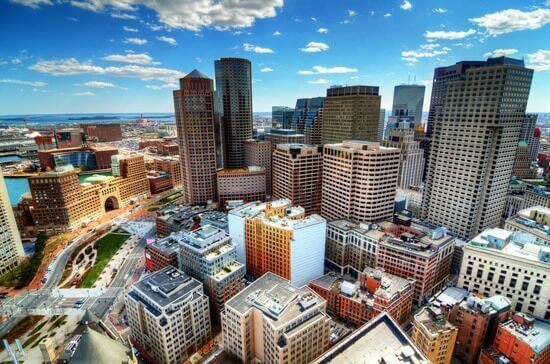 We are also seeing interest from institutional investors as they hone in on areas just outside the Boston real estate marketplace in search of more affordable real estate as close to the city as possible. Boston’s inner city neighborhoods will continue to transition. Jamaica Plain, East Boston and Savin Hill are already on the upswing. Roxbury, Mission Hill, Dorchester and Allston will continue to expand and offer additional housing and commercial opportunities. We predict significant new investments will be made in these neighborhoods in 2018 as developers move farther away from downtown, and as residents search for more affordable places to live. Chelsea is also showing signs of revitalization. Investors and renters may find serious value and upside potential spending more time prospecting these areas. Secondary markets will grow in popularity, particularly those with strong access to transit. Related to the point above, we predict secondary markets – from Braintree to the south and Chelsea to the north – will grow in popularity this year. To put it in perspective: homes in Charlestown are selling for an average $490/SF. Compare that to Chelsea, where the median sales price is just $169/SF. It’s these significant discrepancies in price that often quickly transition an area for the better. Outerlying areas with strong access to transit will be attractive to those commuting downtown. We suspect prices will reach record highs in Somerville and parts of Medford now that the Green Line extension has been fully funded. The big “X Factor” = Amazon HQ2. Boston threw its hat in the ring to recruit Amazon’s second U.S. headquarters, dubbed “HQ2”. Although the city pitched four potential sites, it’s become clear that Suffolk Downs in East Boston is the city’s preferred location. “It’s the perfect site,” says John Barros, the city’s chief of economic development. Pundits have ranked Atlanta and Austin as the top contenders, but Boston generally makes the top 5. Amazon has said it will narrow down its list of options in early 2018, making a final decision before year end. If Boston lands HQ2, this would be a major boon for the local real estate market and could seriously shift where investors place their money. As always, we’ll continue to monitor these trends closely. We nailed 2 of our 3 predictions last year – here’s to hoping for even better results this year! This article has some on-target information about the expectations for the Boston area real estate market. The predictions are in line with what I’ve experienced in the market as a property owner. I am looking forward to investing more in the neighboring areas of the city so this gave me some insight.